During the spring 2016 semester, the WCFTR began to host a digital collection of films on the Internet Archive—a nonprofit dedicated to creating an Internet library and providing long-term access to historical collections in digital formats. While the Center’s digital collection on the Internet Archive is in the earliest stages of development, WCFTR archivists have uploaded eight digitized films that can be streamed, free of charge, to anyone with an internet connection. 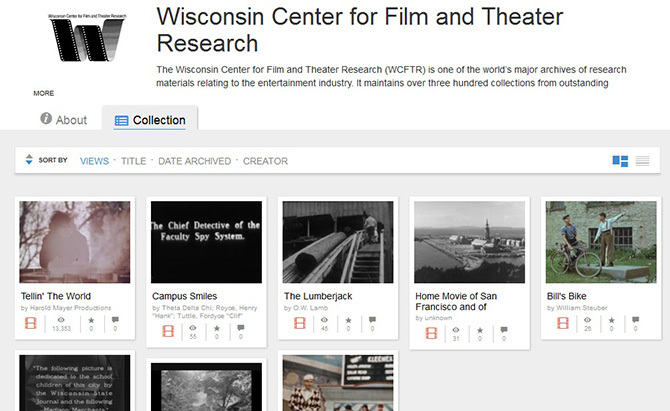 Currently, the Center’s Internet Archive collection focuses on Wisconsin-related home movies and documentaries. One recent upload is Tellin’ the World (1972), a public service announcement for young voters from the Harold and Lynne Rhodes Mayer Collection. In the coming months WCFTR archivists plan to upload streaming versions of other preserved film, video, and audio items, including works by Shirley Clarke, home movies from Broadway’s pre-eminent acting couple, Alfred Lunt and Lynn Fontanne, and audio from the collections of American composer and lyricist Marc Blitzstein.